A monument and park commemorates those who died at Sandakan in 1945 during World War Two. The Japanese occupation of Sandakan during World War Two began on 19 January 1942 and lasted until a brigade of the Australian 9th Division liberated it on 19 October 1945. The Sandakan area is infamous as the site of a World War Two Japanese airfield, built by the forced labour of 6,000 Javanese civilians and Allied prisoners of war. In 1945, the surviving Australian prisoners were sent on the Sandakan Death Marches when Japanese soldiers decided to move about 2,400 prisoners of war in Sandakan 260 kilometres inland to the town of Ranau. Only 6 of them survived the war. 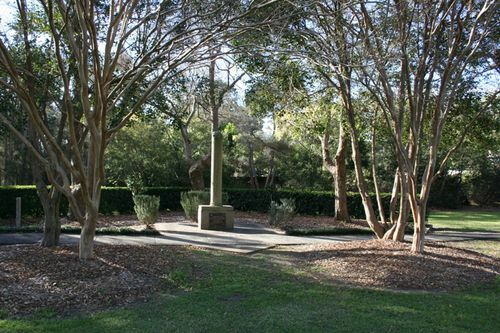 This park was dedicated on 2nd September, 1989 to the memory of the 1800 Australian and 738 British members of the armed forces who died whilst prisoners of the Japanese at Sandakan in British North Borneo during World War Two. Only six survived the infamous Sandakan death March. Accompanied by MR OWEN CAMPBELL, B.E.M. One of the six survivors of Sandakan, in the presence of Major-General Sir Ivan Dougherty, CBE, DSO, ED, Bec, LLD.